For the other versions of this character, see Aporia (disambiguation). Yu-Gi-Oh! 5D's episode 134: "For Synchro's Sake"
Aporia was a survivor of the Meklord Emperor Genocide, and a member of the Iliaster's Four Stars of Destruction. After Aporia's natural death, three androids based on the different stages of Aporia's lives, named Jakob, Primo and Lester, were created by Z-one and sent to the past to change the future at all costs. Eventually the androids merged together to form a fourth android with the memories and personality of the original Aporia. He would stop at nothing to make sure his mission was carried out. He was defeated by Z-one after he had a change of heart and tried to stop him from destroying the future. Before his death he combined his Duel Disk with the Yusei Go ahead of Yusei's battle with Z-one. Unlike the other survivors of the apocalyptic future, his cyborg form didn't resemble his younger self, as he existed as a combination of his embodiments. He had the face, half of his hair color, voice, and lower body of Primo, the other half of his hair color, and Duel Disk of Lester, and the large physique and hands of Jakob. In addition, the three smaller jewels on each of their heads combined into a large one on his forehead. He had multilayered blue eyebrows, and red eyes, in addition to fangs. Aporia's chest resembles that of his ace card, "Meklord Astro Mekanikle". When Aporia first fought Team 5D's, he stated that he was an embodiment of despair because of what he had suffered in the original future. However, after fighting so many times against the Signers, Aporia's personality transformed. His first shift in personality was through the claim that he felt neither hope or despair, and that the only thing he needed were machines and felt his android form was superior to his organical body. Afterwards, he had gotten to the point where he believed the human heart was a useless thing and that because of its existence, mistakes and the eventual despair were created. During his Duel against Jack, Leo and Luna, he became briefly unstable, first by remaining in cold logic and mostly emotionless after he easily took out a majority of his opponents' Life Points, but later burst into fear and despair when things were turned in his opponents' favor while trying to deny he felt any despair. Jack points out what he feels wasn't despair, but hope. Aporia realizes this and admits it after losing. After this loss, Aporia stated to Team 5D's that the true reason he had continued to live even after suffering for so long, was that because he himself never lost hope, believing that it could be found within the depths of despair: effectively fighting for the very hope he had deemed futile. Linework of Aporia after merging with "Fortissimo"
Aporia's body is an android much like his counterparts, with the qualities of the real person. Just like Jakob, and Primo, Aporia can fuse with his Duel Runner. He can even use the ring fused to his back as his Duel Disk much like Lester. Aporia can also combine with his Field Spell Card "Fortissimo the Mobile Fortress" in the same manner. He is also capable of materialize his own cards to damage the environment around him. 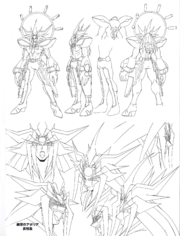 Aporia is later shown to be telepathic, following his conversation with Z-one after being brought aboard the Divine Temple. His Duel Disk was able to give the Yusei Go the power of flight temporarily for his Duel against Z-one. The name "Aporia" comes from the Greek word "ἀπορία", which literally means to question or wonder and is used in philosophy to refer to a philosophical puzzle or state of puzzlement, and, in rhetoric, a rhetorically useful expression of doubt. Additionally, "Aporia" was a Greek mythological deity personifying difficulty, perplexity, powerlessness, and want of means. It may also derive from another Greek word "απόρροια", which literally means result. Due to the fact that in Japanese, "l" may be pronounced as "r", the name may derive from the Greek word "απώλεια" (it is pronounced "apólia"), which actually means loss (metaphorically it also means death). The name could represent the state of "Aporia" after losing all people that loved him and he loved back, and eventually the loss of his hope. As the world was evolving at an ever-increasing rate, the human race became dependent on the Ener-D system and Synchro Summons, which were the gears that accelerated the spin of the Ener-D system. As the people became more greedy and selfish, the Ener-D system reacted to this by spinning faster and faster, and eventually, the speed became uncontrollable. As a result of this an invasion of Meklord Emperors were set upon the world and the world was sent to ruin after the invasion. All lifeforms in the world had been vanquished by the subsequent Meklord Emperor invasion. As a child, Aporia, along with his mother and father, was chased by a "Meklord Emperor Granel". It fired a beam at them, killing his parents and leaving Aporia alive. He regarded the loss of the people that loved him as the first of three major despairs in his life. His hair turned prematurely gray some time between this incident and before he reached his adulthood. At some point in his life, Aporia met and fell in love with a fellow freedom fighter named Eurea, whom he fought the Meklord Emperors with. The pair attempted to ambush a "Meklord Emperor Granel" using rocket launchers. However, the "Meklord Emperor" retaliated by blowing up half the building they were shooting from, taking Aporia's lover with it. Aporia regarded the loss of the one he loved as the second of three major despairs in his life. The Ener-D eventually changed and spun in the opposite direction, sparking a global disaster that eventually wiped out the majority of mankind. In his old age, Aporia found himself alone and believed himself to be the only survivor. Aporia regarded the sentiment of "having nobody left to love" as the third of the three major despairs of his life. Aporia soon discovered he wasn't the only survivor when he met Antinomy, Paradox and Z-one. Being the last survivors on Earth, the four of them formed Iliaster with the mission to create a better future. Aporia on his deathbed, speaking to Z-one. The four survivors attempted to dispose of the core power of Ener-D, the source that had wiped out the world before. They performed countless experiments in an attempt to find a solution to restore the world to its former state. However, as time passed, Antinomy and Paradox died of old age and Z-one became more mechanical. Aporia considered himself to be the only one left alive. Aporia was placed in a capsule as he neared the end of his life. He asked Z-one to do whatever it took to prevent their future from ever occurring and insisted that Z-one split him into three embodiments based on the three despairs of his life. The three embodiments, Lester, Jakob and Primo. Keeping his word, Z-one split Aporia's being into three android-like embodiments of despair, Lester, Primo and Jakob, who were sent back in time. They became the Three Pure Nobles and used their power of falsification of history to alter the current events in time, including having themselves enrolled into the World Racing Grand Prix as Team New World. Team New World faced Team 5D's in the final event of the tournament. When both teams were down to their last Duelist, Yusei Fudo destroyed Jakob's "Meklord Emperor Granel" with "Shooting Star Dragon". The three embodiments then combined back into Aporia. The embodiments merge into Aporia. Aporia took over Yusei and Jakob's Duel and proceeded to Summon his "Meklord Astro Mekanikle", overwhelming Yusei and putting him at a severe disadvantage. Aporia showed Team 5D's the future world from which he had come and explained that he was going to remove New Domino City from history to prevent it from happening. However Yusei refused to believe that humans were the reason that the future world had been destroyed and continued to fight on. Yusei managed to Summon "Red Nova Dragon", "Black-Winged Dragon" and "Shooting Star Dragon" and use them to defeat Aporia. Contrary to what Aporia had expected, the Grand Design was completed despite his loss and the Divine Temple began to descend on New Domino. 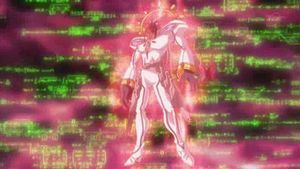 Z-one managed to recover Aporia's mechanical body and took it to the Divine Temple, where his human body still resided. Z-one informed him of the Divine Temple's appearance over New Domino despite the loss. Z-one explained that an outside interference has caused the future to change. Z-one asked if Aporia was willing to try to change the future again, only for him to respond that he would do anything. Aporia felt much obliged, as he regarded Z-one as his eternal friend. 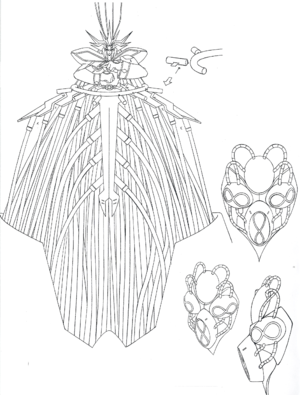 Tools then began to repair Aporia's mechanical body. With his repairs fully completed, Aporia stood to protect the second Gear where he is challenged by Jack, Leo and Luna. In a 3-on-1 Duel, they are forcibly equipped with machines that inflict real damage. After Summoning "Meklord Astro Dragon Asterisk" and his "Meklord Army" monsters, Aporia reduces Jack and Luna's Life Points to 700 and 100 respectively. Leo begins crying and Aporia simply ends his turn after explaining to Leo that what he is feeling is true despair. However, Jack shows Leo how to never give into despair and keep believing in hope. After doing so, Jack's Life Points are reduced to 100, but Leo begins acting as Jack and Luna's shield. Leo ends up dying from the damage, but Ancient Fairy Dragon explains that she needs him to protect Luna and revives him through the effect of "Morphtronic Lantron". Leo is then revived as a Signer and Aporia watches helplessly as Leo Summons "Life Stream Dragon". Through its effect, Luna, Jack and Leo's Life Points become 2000 and further effect damage is prevented. When Aporia realizes he is about to lose, he wonders if it is because he feels despair. Jack explains to him that fighting to protect Z-one makes Aporia feel hope, not despair. Jack's attack reduces Aporia's life to 0. As the field surrounding them collapses, Jack, Leo and Luna escape. Aporia then begins falling to his death, with a smile on his face and notes that he feels no pain, only hope. However, he later reappears at the central gear to Team 5D's, having survived the falling before, but his mechanical body is heavily damaged and malfunctioning. He challenges Z-one in an effort to show him there is still hope in the future. 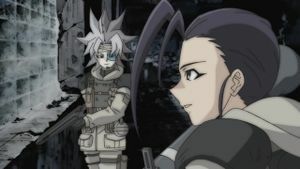 Before the Duels begins, Aporia reveals to Leo that witnessing the hope the Signer had during their Duel, made him realize the bonds within Team 5D's, as well as Leo's own personal growth, is the same hope Aporia himself had been searching for so long. That same hope being the reason he will fight against Z-one. Zone effortlessly overpowers Aporia with his Timelords, but Aporia refuses to give up and draws "Afterglow", the card he plans to show Z-one that there is still hope. Aporia proceeds to mill his entire deck so that when he activates "Afterglow", it will be the only card in his Deck thus he will be guaranteed to draw it again and win. Z-one however ruins that plan with "Lazion, the Timelord", which returns Aporia's Graveyard to his Deck and shuffles it. If Aporia fails to draw "Afterglow", the effect of "Lazion" effect will finish him off, giving Aporia a 1/34 chance to win. Aporia refuses to give up and draws, but instead of getting "Afterglow", he draws the monster that caused the despair in his life, "Meklord Emperor Granel". Z-one taunts Aporia about his futile efforts before finishing him off. The damage taken critically damages Aporia's already malfunctioning body and he collapses. Team 5D rushes to try to help Aporia. Aporia feels he failed to give anyone hope, but Yusei points out that thanks to him now they know how Z-one's deck works and that knowledge will give them hope to save the future. Satisfied by hearing that, he fuses his Duel Disk with Yusei's Duel Runner, giving it the power to fly, for the final Duel between Yusei and Z-one, right before his body finally gives in and he dies. Z-one shruggs off killing Aporia by pointing out that was nothing but a mechanical replica and that the real Aporia had already died long ago. Later, when Yusei battles Z-one, Yusei thinks of all of his friends and allies and Aporia is seen right before Bruno. 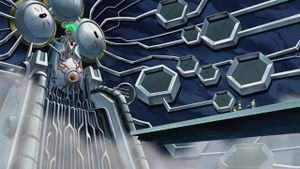 Afterwards, in order to stop the Divine Temple from falling onto New Domino City, Yusei decides to throw himself and his Duel Runner, with an Ener-D reactor within it, into the Divine Temple's reactor. However, Z-one stops Yusei and sacrifices himself instead. Before Z-one dies, he wishes to still meet Aporia in the future. Aporia holds great respect for Z-one, and considers him his true friend. After Z-one agreed to separate him into three embodiements of despair, Aporia said he knew Z-one would save the future. However, things took a turn after losing to Jack, Luna and Leo, as he tried to convince him to leave the future in the hands of Team 5D's. 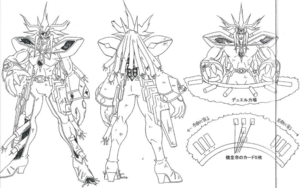 During his fight with Z-one, Aporia tried to show Z-one hope by drawing "Afterglow", but was ultimately defeated due to not drawing it. Aporia uses a "Meklord" Deck, focused around a combination of "Fortissimo the Mobile Fortress", "Level Cannon" and "Lock-On Laser" to inflict large amounts of effect damage. He also utilizes cards such as "Damage Boost" to punish anti-Burning severely. 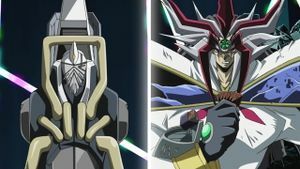 During his Duel with Z-one, Aporia uses the "Meklord Emperors" to thin his Deck in an attempted One Turn Kill strategy with "Afterglow", also using cards such as "Chaos Blast" and "Future Destruction" to hurry the process up further. ↑ 2.0 2.1 Yu-Gi-Oh! 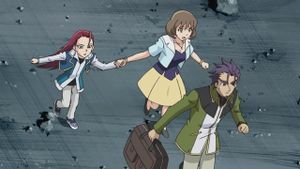 5D's episode 135: "Fight for the Future"
↑ Yu-Gi-Oh! 5D's episode 141: "Duel of Despair! Fortissimo the Mobile Fortress!" ↑ Yu-Gi-Oh! 5D's episode 142: "A Life-or-Death Battle! Machine Imperial God Dragon Asterisk"
↑ Yu-Gi-Oh! 5D's episode 143: "The Miracle of Life, Life Stream Dragon!!" ↑ 6.0 6.1 Yu-Gi-Oh! 5D's episode 146: "The Last Human, Z-ONE"
↑ 7.0 7.1 7.2 7.3 7.4 7.5 7.6 7.7 7.8 7.9 Yu-Gi-Oh! 5D's episode 135: "Fight for the Future"
↑ 8.0 8.1 8.2 Yu-Gi-Oh! 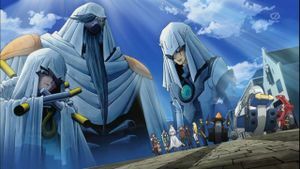 5D's episode 137: "An Approaching Terror - The Citadel of God, Ark Cradle"
↑ Yu-Gi-Oh! 5D's episode 117: "The Distorted Past"
↑ Yu-Gi-Oh! 5D's episode 147: "A Hope Bound for the Future!" This page was last edited on 29 September 2018, at 14:28.